Convection occurs when heat travels upwards through air or liquid and in turn heats objects it surrounds. Warmer air becomes less dense causing it to be lighter and rise. Convention can also occur sideways as in a wind. It is usually not a problem in the summer, but it can be an energy sponge in the winter. The culprit is moisture (or Convection). Our daily activities of cooking, showering, drying clothes, etc. will cause Convection and allows moisture to easily pass through our ceilings and into our Insulation. With just a 1 1/2% increase in moisture content, Conduction takes place and a 36% decrease in insulation performance will occur. Carefully calculated ventilation in your attic will take care of this problem. Proper ventilation will reduce your home's energy consumption in warm months and prevent the damaging effect of moisture buildup in the colder months. Attic Comfort utilizes a variety of ventilation techniques and hardware to maximize your home's energy efficiency and increase the performance of our Radiant Barrier. Help conserve our nation's limited energy supply. Attic Comfort wants to make it as easy as possible for you to learn more about the benefits of our Comfortable Attic Program. Contact us to schedule a free, no obligation, in-home consultation. 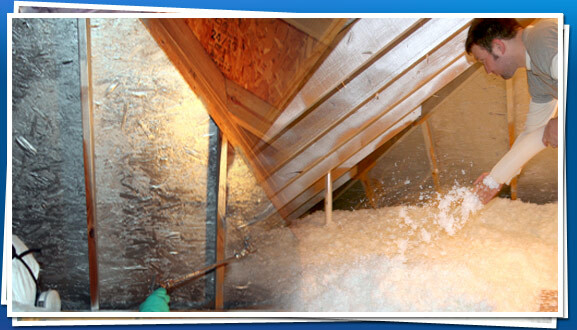 An Attic Comfort energy savings specialist will complete a thorough analysis of your home's attic and recommend a customized Comfortable Attic Program tailored to your needs. Don't delay ... Contact us today! There's no better time than now to maximize your home's energy efficiency and begin reducing your energy costs for years to come.